The ecclesiastic mint at Reading Abbey was given rights to produce pennies, halfpence and farthings in a royal charter of 1338. Whilst John Stoke de Appleford was abbot, in the year 1337, Edward III borrowed from the abbey certain valuables, estimated at £277 4s., including a chalice and paten (a plate used to carry the bread at the Eucharist) of pure gold worth £22 15s., another pure gold chalice worth £54 9s., and a small reliquary of pure gold after the fashion of a feretory (a portable bier or shrine), garnished with sapphires, pearls, rubies, etc., and worth £200. The king pledged himself to restore them or their value. In consideration of this loan, the king renewed to the abbey the privilege of a mint, of which they had been deprived by Edward I. This allowed the Abbot to coin farthings and halfpennies with pennies as before. Doran², states that the jewels borrowed by Edward III in the 12th year of his reign were worth £224 9s and he borrowed a further £100 of jewels in the 20th year of his reign (1346). No "star-marked" farthings have been discovered from the Reading mint - but permission to produce them most certainly existed. The writ of 26th August 1338, re-issued on the 8th November, instructed The Exchequer to supply die's for pence, halfpence and farthings. A second writ of 17th November 1338 required the warden of the London mint to supply the dies by 25th November - with marks, inscription specified by the abbot. 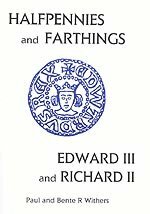 On 22nd of February 1339 a final writ to The Exchequer stated that the abbot and monks of Reading had received their penny die, and it ordered the delivery of halfpenny and farthing dies being kept by The Exchequer. 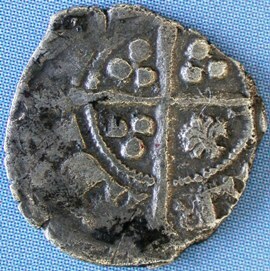 Jeffrey North has suggested that the Reading Abbey received the unprecedented right to mint these coins (halfpennies and farthings at 0.833 fineness) because the minting of sterling silver pence was unprofitable due to the increasing cost of silver bullion. 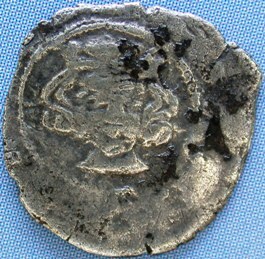 The Fox brothers noted the probable unprofitability of minting pence in Reading before the weight reduction of 1344, but a Reading penny from the dies of 1338 has now been found by a metal detectorist and identified by the coin dealer, Mike Vosper. shell in the LAR quarter. Uncertain N.
shell in the VIL quarter. Uncertain N.
244, 248, 288 and App. viii. ² DORAN, J. 1835: The History and Antiquities of the Town and Borough of Reading in Berkshire.